In The Stages of Economic Growth, for which he is known around the world, W. W. Rostow distinguished five basic stages of growth experienced by societies as they change from a pre-industrial state to full economic maturity. 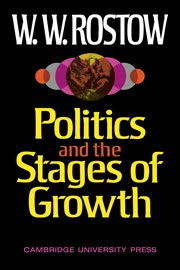 In this book the analysis is continued but the focus is shifted, from economic growth to politics. Professor Rostow see politics as an eternal triangle of competing imperatives - of security, welfare, and constitutional order. Using this concept, he examines the political meaning and content of each of the stages as experienced by eight countries; Great Britain, France, China, Japan, Russia, Turkey, Mexico and the United States. He goes on to consider, in the heart of the book, a uniquely political stage: the search for quality which is possible in an age of high mass consumption. Special attention is given the United States. Professor Rostow also examines the character of politics in the developing nations of today, and makes explicit what he sees to be the lessons of history and the contemporary world for these nations. He concludes by using his analysis to speculate on possibilities for peace in the global community.